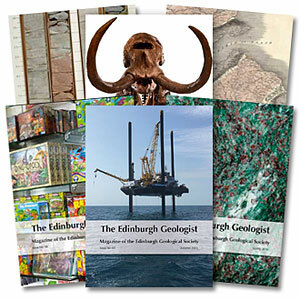 The Edinburgh Geologist is a twice yearly magazine for everyone with a broad interest in geology. Its short articles on geology with a Scottish flavour aim to entertain and inform, and are accompanied by book reviews and occasional creative writings. The first issue was published in Spring 1977 under the Editorship of Helena Butler. In the following twenty-nine years there were 45 issues and 8 Editors up to Vol 45, in Autumn 2005. After a break, the Edinburgh Geologist was revived as an biannual publication with Vol 46 published in 2009. Issue No 53 – Spring 2013 | Supplement: Dalradian. Doug Fettes. | Supplement: Book Review. John Mendum.